The team at Fence Factory prides ourselves on quality products, and we strive to offer our customers the best products available on the market. Our goal is to help you increase the value and beauty of your home. This is why we only use the best, most durable wood we can get our hands on for your fencing needs. 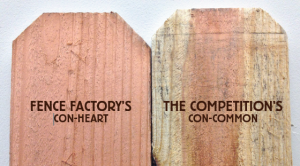 Here at Fence Factory, we are proud to offer Construction Heart (Con-Heart) Redwood as a choice wood option for your construction needs. Con-Heart Redwood is a vers atile, sustainable, premium quality wood that is cut directly from the center of the tree. This type of Redwood is rich in tannins, which gives it a distinct reddish color. The closer to the heart of a Redwood tree you get, the richer the color will be. If you’re looking to accentuate the striking color of the wood, Redwood offers a unique cell structure that will actually hold on to a finish better than other woods. 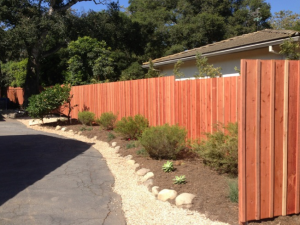 It also will not stain like plastic, and a simple refinish every few years will keep your fence or deck looking like new. Another bonus- these rich tannins make Heartwood more resistant to decay from insects or fungi. It’s also proven to have a natural resistance to warping, shrinking, and checking. Our Con-Heartwood will give your home years of hassle free performance. Even after years of owning your home, the beauty of Redwood will endure.